Before I officially start naming the roster of my Sunflower League All-Decade Team, there are a few key things I need to point out. 1. The roster size came out to be 29. I know, that's more than 22, or 24 with a punter and kicker, but it was very difficulty to squeeze all of the players I felt worthy of the honor into the 22 or so slots. Several key positions (including quarterback) having two players. I also included several players who I listed as "athletes" because they had a great prowess on both sides of the ball. 2. Unfortunately I don't have an archive of every player's stats throughout the 2000s. Some players, as I found out, never had their season or career stats published online--which invariably made it difficult to come up with those player's statistics. But, with the exception of a few players, I was able to unpile stats for most everyone. 3. The list is no basis more reliable than my own experience and perception of the players of the decade. I competed against a few, watched most live, but read about them all. The first player on the list is...Jason Santifer, who I listed under the athlete position. If you take a look at Jason Santifer’s stats following his high school career, you would have a difficult time deciding what exactly his main position was. For that reason, Santifer is on the athletes list. Santifer was too multi-talented to categorize him at one position. 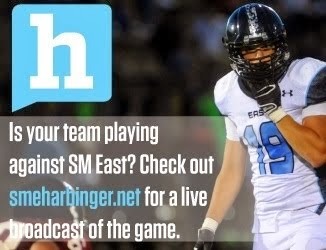 As a junior Santifer gained the recognition as Olathe South’s key playmaker. On the season he returned kick and punts, played receiver, defensive back, and also mixed in reps at the running back position. Santifer and Olathe South had one of their best seasons of the decade. They thrashed the defending state champion Olathe North 31-8 in a key District game that kept Olathe North out of the playoffs. From there Olathe South won their next three games and advanced to the 6A state championship game in Wichita. There they fell at the hands of Garden City, 14-7. Olathe South’s success during the 1999 season wouldn’t have happened without Santifer’s abilities. On the season he defensively had 49 tackles, 12 pass break-ups, and 3 interceptions. Offensively Santifer ran the ball 43 times for 332 yards, and make 33 catches for 511 yards and two touchdowns. This was in addition to the six kick returns he had that totaled 198 yards and one touchdown. Santifer received First Team All-Sunflower League honors for his efforts. 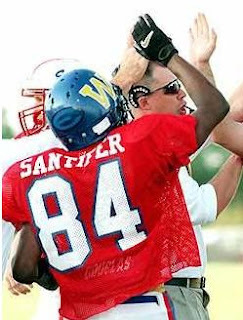 The 2000 season was another opportunity for Santifer to display his skills and hopefully win a state title with a talented Olathe South team. Santifer and the Falcons roared to an 8-0 start to the season. The finale pitted the Falcons against the undefeated Olathe North Eagles, and Darren Sproles. Olathe North, hungry for revenge, jumped to a 7-0 lead on the first offensive play of the game. Olathe North went on to win 49-20. Olathe South became one of the few teams to ever go 8-1 and not make the playoffs over the decade. Santifer’s efforts on the season, however, were not overlooked. Defensively he made 35 tackles, and intercepted five passes. He ran the ball 28 times for 379 yards and six touchdowns, and he caught 27 passes for 243 yards and two touchdowns. Santifer returned three kickoffs for touchdowns as well. Santifer was named First Team All-State Class 6A, in addition to being named first team KC Metro Sports at the Multi-Purpose position. 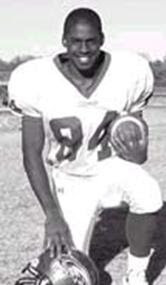 Santifer went on to play receiver at D1-AA powerhouse Northern Iowa. I'll be putting up one or two All-Decade players every week from here on out. Glad to see the interest!